In the Wild West of Canada, the natives were restless and seeking redress for their grievances from the government in eastern Canada. Matters came to a head in 1869 as Louis Riel led a successful rebellion, forcing the government into a compromise. This resulted in the Manintoa Act and caused Louis to flee to the United States. Then again, in May of 1885, the North-West Rebellion broke out and Louis Reil returned to lead it. However, this time, the Canadian government crushed the revolt militarily, and Louis was captured to stand trial. 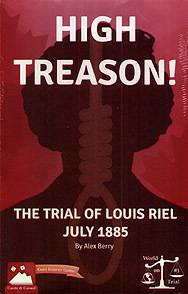 It is July of 1885, and over five fateful days Louis Riel must face the trial for his life on a charge of High Treason. The government has changed the venue to a location more favourable to the prosecution and brought in top lawyers to see that justice will be swift and sure. Oddly enough, this capital case only saw six jurors seated. Louis' team of attorneys is angling for an insanity defence, but the prosecution is ready to rebut those arguments. More than the body of one man, Louis Reil, may hang in the trial's outcome. The face of a nation is also on trial and can just as assuredly hang on the balance of justice. High Treason! The Trial of Louis Riel is a two-player 40-minute card game where the players lead the prosecution or defence of one of history's heroic and tragic figures. The deck is stacked for the prosecution, but the burden required for a hanging conviction is as high as the gallows. You will question prospective jurors and dismiss those least helpful to your case, after which the trial begins in earnest. There are many paths to victory: swaying the jurors personally and 'locking' them into your outlook, swaying the jurors on key personal matters such as their language, religion, and occupations. The prosecution must also present evidence of guilt and rebut evidence of insanity, while the defence must do the opposite. When the trial is over, the jurors deliberate and score their verdict to determine the fate of the defendant, Louis Riel. Can you triumph on the courtroom stage with a man's life at stake? Find out with High Treason! The Trial of Louis Riel.